Angela Dye prides herself on being a product of the urban environment and has a background that personally relates to the at-risk learners she serves. With degrees in education and social science, Angela identifies as being a social change agent. As an author, teacher and entrepreneur, her career choices have always centered on empowering individuals who have been socially marginalized and politically disenfranchised. 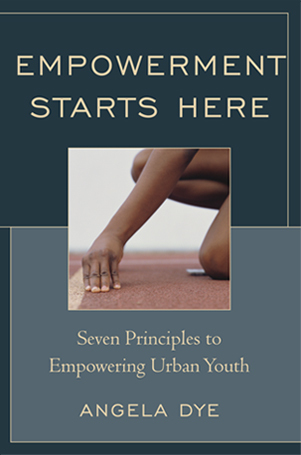 Through lessons grounded in constructivist thinking, global leadership and personal responsibility, she has developed an instructional process that embraces seven distinct principles of empowerment. Angela is working on her doctorate in education where she seeks to strengthen this framework while studying the social constructs of academic achievement. Using her graduate studies, professional experiences, and personal life story, Angela is currently launching a consulting practice to promote student empowerment and social change.